A memoir of a busy spiritualist in Ireland. Padre Pio of Pietrelcina, an Italian priest who was canonized by Pope John Paul II in 2002, provides the cornerstone of Donnelly’s slim nonfiction debut; she relates her experience of communicating with the saint at the start of the narrative. 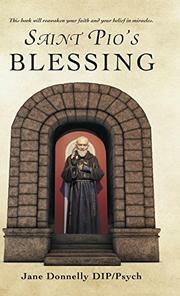 The author, a “self employed healer, spirit medium, Angel therapist, Reiki Master and shop owner” in Killarney, opens her book with a quick allusion to a moment on July 4, 2016, when she says that she had a visitation from St. Pio (“I saw Saint Pio standing there and he gave me a blessing!”), then backtracks to describe the personal and spiritual journeys that brought her to that point. Donnelly’s enthusiasm for tarot cards, the concept of past-life regression, and other spiritualist ideas led to her open a spiritualism shop of her own in 2014 that did such brisk business that it later moved into larger quarters the next year. Donnelly visited a church with her husband where she encountered a book on the life of Padre Pio and immediately felt resonances with her own past-life regressions. Curiously, though, the titular saint disappears for the bulk of the book, which instead concerns itself with the day-to-day activities of the author as an active business owner, a devoted wife and mother, and a constantly learning medium and spiritualist. Readers, regardless of their own spiritual beliefs, will find Donnelly’s accounts of her supernatural experiences, which include dealings with Archangel Michael and a host of spirits, to be entertaining. Donnelly’s tone is unfailingly upbeat, as seen in such interjections as “Nature is so beautiful, the weather was stunning and I was feeling the blessings in my life, deep within my heart and soul.” Even when her husband, Mike, is going through a course of chemotherapy, her spirit is undaunted: “I sat in gratitude to thank God for the blessings overflowing in my life; my heart was bursting with thanks.” And she renders homely details—meals with family, quiet mornings, going out with friends—in warm, lively tones. A vivid, dramatic overview of an upbeat medium’s life.